The Tourist Information Office in L'Isle-sur-la-Sorgue is in the center of the island, at Place de la Liberté. The staff can provide a useful small map of the town, a suggested walking tour to see the water wheels, and information on other things to see and do in the area. On Thursdays and Sundays the Place de la Liberté will be busy with the market, so be prepared for crowds—and lots of great food and other things! 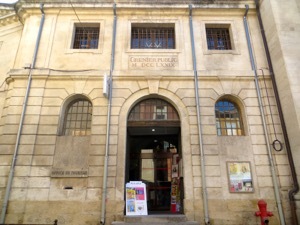 Tourist Information Office, on the Place de la Liberté, L'Isle-sur-la-Sorgue.